We can take payment from Paypal or Credit Card,please email us or upload the gerber files in your account.After you receive the offical quote you can place order online.You can also email gerber274X+NC drill files to sales@goldphoenixpcb.com ask for a quote. The size above means total size of ONE Design combined (Price does not apply to combine several designs together). For example if you have a 2Layers 2"X2" with standard spec,USD110 include shipping to North America we will make 38pcs individual board for you, if you need panelize we will do the step and repeat free of charge. 2. Minimum clearance and trace width 7mil, minimum hole size 15mil. 3. NO LIMIT ON THE NUMBER OF VIAS, MAXIMUM ONE INNER CUT PER BOARD. 4. NO LIMIT ON THE NUMBER OF SMD OR PTH COMPONENTS. 6. If you want the boards be panelized. Maximum board size X or Y size 14.5", maximum panel size 14.5"X10" INDIVIDUAL BOARDS WILL NOT HAVE THIS LIMIT. 7. Min board size 1"X1", when the board X or Y size is less than 1", Square board 155inch sq max QTY 100pcs, complex shape 50pcs. 100inch sq square board 50pcs, complex shape 25pcs. 8. No Electrical Testing for 1-2 Layers, maximum 15% fail rate, Free Testing for 4-8 Layers, maximum fail rate 2%. 9. No Blind or buried holes, or impedance confrol for multi-Layers PCB. 1. High quality Polyimide material , 0.0039"(0.1mm) with UL certificated, Two Side Green solder Mask, One Side White silkscreen, "HAL",1OZ copper. Free Shipping by FEDEX to North America. 4.NO LIMIT ON THE NUMBER OF SMD OR PTH COMPONENTS. 6. If you want the boards be panelized. Maximum board size X or Y size 10", maximum panel size 10"X10" INDIVIDUAL BOARDS WILL NOT HAVE THIS LIMIT. 7. Min board size 1"X1", when the board X or Y size is less than 1", the price will be 50pcs USD280 due to the complex of V score. When the board shape is not square 30pcs USD280, because complex routing is needed for the board. Panelization of the multi-project panel must be done at customer side. We do not offer service to panelize multi-project panel. We need 40mil clearance between the boards. We can also separate the multi-project panel if the number of different projects on the panel is less than six, otherwise de-panelization must be done at customer side. If all designs on the panel are square and the same size, V score can be applied to the panel and number of project is 20. For multi-Layers PCB we charge a extra fee for each design you added to the multi-project panel, for example 4 Layers we charge $80/design, 6Layers extra$100/design, 8Layers extra $150/design. To order multi-project panel, customer must allow 15% fail rate for the small unite on the panel. Holidays in China: Labor's days( May 1st-May 3th), National day (Oct1 -Oct 3th), New Year (Jan 1st), Chinese New Year. Shipping time is 3-4 business days to North America, 4-5 business days around world if the order is shipped by FEDEX. 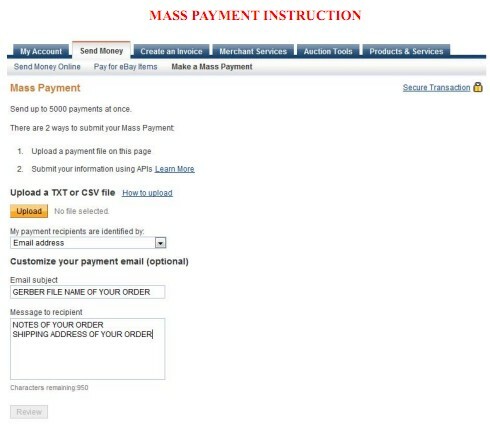 Paypal payment instruction Updated in 2011. 1) PLEASE SEND AN NOTICE EMAIL TO sales@goldphoenixpcb.com AFTER YOU SEND THE PAYMENT. 2) PLEASE PUT THE “GERBER FILE’S NAME” ON THE PAYPAL PAYMENT FILE. PLEASE SEND THE PAYPAL PAYMENT USE MASS PAYMENT. 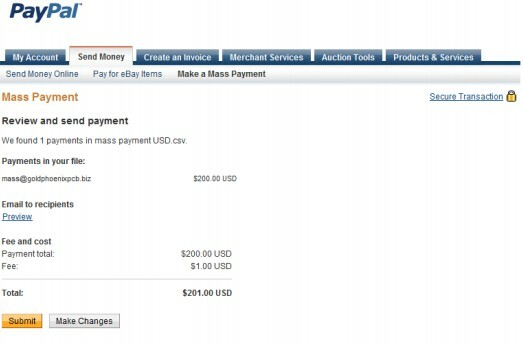 For mass payment the cost to the sender only USD1 to send each payment. And for us it is free to receive the payment. The payment instruction is below. You must have a PayPal Premier account or Business account, and it must be a verified account, before you can use Mass Payments. If you do not want pay the paypal fee please read the instruction below, and send the payment as mass payment. 1) "Paypal Mass payment" please send to mass@goldphoenixpcb.biz. We created a mass payment file for you (CAD.csv/USD.csv). PLEASE CHANGE THE “PAYMENT AMOUNT” AND NOTES IN THE PAYMENT FILE. 1) CHANGE THE “PAYMENT AMOUNT” AND NOTES IN THE PAYMENT FILE. Then upload the “CSV” file we send you. 1. Choose how you will generate the payment file. You can use a notepad, database, or a spreadsheet application like Microsoft Excel. 2. Arrange your recipient information. Let’s say you’ll be using Microsoft Excel to arrange your data. Each row in your file should contain all the data for one recipient, divided into 5 columns. From left to right, you’d enter email address, payment amount, and currency type. The first 3 columns are required; the 4th and 5th columns are optional and can be used for your internal tracking or for adding a note to the recipient. o The email address, for your recipient. o The amount you’ll be sending to that recipient. o The 3-letter currency abbreviation. See table below. o An optional field for unique customer IDs, identifiers, etc. o An optional field for a custom note to your recipient. Each corner or "turn" on your pcb is a rout point - that is every time the router bit turns or stops. Each radius is three points. Count 8 for a circle and for each tab-routed pcb in an array configuration. More than 6 routing points will be consider as complex shape board by GP.